I made this last week and the week before. I started with the chap lounging dramatically in the chair with a sword, having chosen his photo because he has a nice open pose and it's easy to see how long his legs are and where his muscles are etc. The week before last's art class commented that 1) he was very pleased with himself, and 2) that he had a very nice chair. 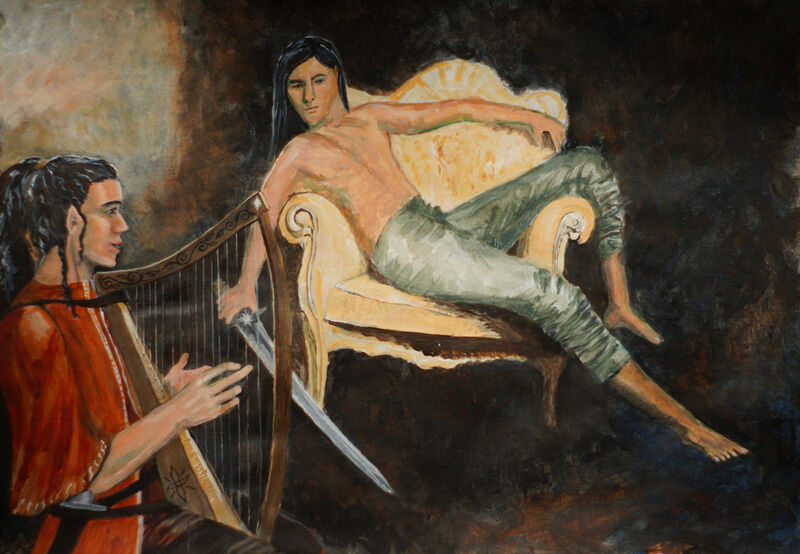 So I added a brother with a harp making sarcastic remarks for him to look at indignantly so I could practice hands, and worked a bit more on the Nice Chair. Harpstrings are really hard to paint, but fortunately Colin the Art had painted a lot of violins and knew just how to do it. The face on the left hasn't photographed very well, the highlights should be rather more subtle. Curufin is showing off some excellent anatomy here. I totally believe in the harp strings and I can almost see the sarcastic comments on Maglor's lips. Maglor's hands are lovely, and the trousers are va va voom!